I noticed this pizza place on Urbanspoon, and that it was more popular then Hideaway. We checked it out last night. 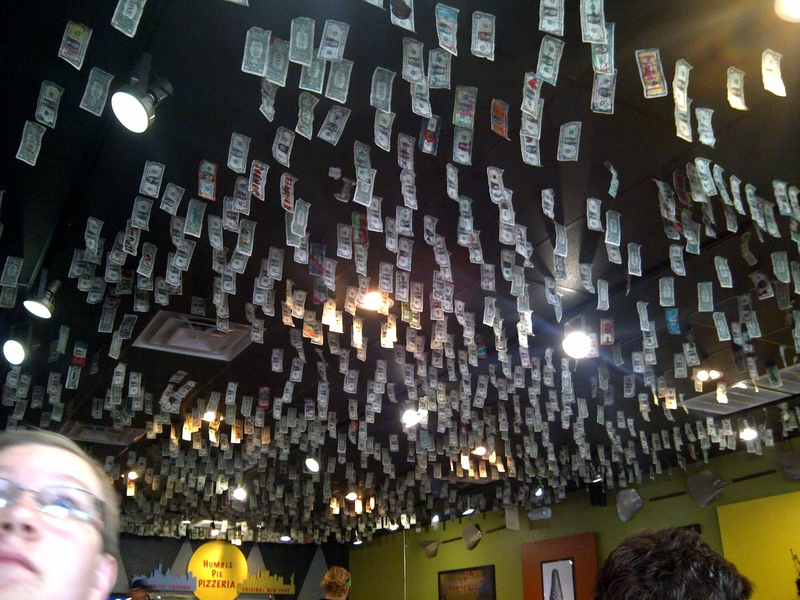 When you come in, you notice that the ceiling is covered in bills. The bills (some of which are artworks) are collected and donated to charity. A good thing. We ordered two pizzas. Raegan got the small (essentially one or two person) pizza, the “Greek Goddess”. Ian and I spit a larger New York style pizza. My half had pepperoni, sliced sausage, and canadian bacon. Ian had sliced sausage and light marinara. The pizza came with almost no marinara. I asked for a side of the stuff, and used it. The marinara was excellent. The pizza was very, very good. If it had had proper marinara, it would have been an outstanding pizza. The crust has a yeasty flavor that is very good; it’s kind of chewy. The place was pretty busy when we got there. The menu says it takes something like 40 min to make a pie; that’s about what it took for us. We got there around 1800 and left around 2000. Our check was $34.15, a good value. The tea was good (they only do sweet tea on the weekends). Service was good. I would gladly go back. I want to try the Chicago style pizza, and also get a New York prepared with marinara. Great stuff. This entry was posted on 12 July 2012 at 04:21 and is filed under Oklahoma City, Restaurants and Eating. You can follow any responses to this entry through the RSS 2.0 feed. You can leave a response, or trackback from your own site.